CNN has video, and the Associated Press has a story, about the Parajet Skycar, which set out from London on a voyage to Timbuktu, Mali, in the deep Sahara. The trip will take them through Spain, Morocco, and the disputed territory of Western Sahara. The brainchild of inventor Giles Cardozo, the craft is piloted and/or driven by Neil Laughton, late of Her Majesty’s Special Air Service. The Parajet Skycar is essentially a dune buggy with a huge fan attached, not unlike the airboats used to cruise all zoomy-like on the Florida Everglades and elsewhere. It flies using a paraglider wing. On this trip to Timbuktu, the Skycar will drive where there are roads — across Europe, ferinistance — but will fly across the Straits of Gibraltar, the Atlas Mountains in northern Morocco, and the vast tracts of the Sahara where there are no roads. 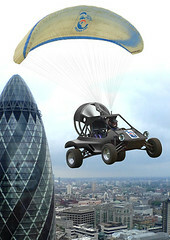 Almost as cool as flying from London to Mali: according to a NextAutos.com story from last July, the Skycar is carbon-neutral. I’m not entirely sure what that means, but the NextAutos story says the thing is biofuel powered. Showing himself to be exactly the type of happy-go-lucky guy who pilots a flying dune buggy from London to Mali, Laughton expresses his excitement about landing in African towns. “I just can’t wait to see their faces when we fly in and start playing football with them,” he said.